Plaque on the approximate site of the Marshfield Tea Party. It is rather hidden nowadays. On January 23, 1775, roughly one hundred British soldiers disembarked at the mouth of the North River in Marshfield on the South Shore of Massachusetts. The men belonged to the 4th Regiment of Foot, known as the King’s Own. The detachment was commanded by Captain Nesbit Balfour. They brought with them two artillery pieces and 300 muskets to be used by the gentlemen of Marshfield against the rebels. The force formed up and marched through the center of Marshfield, utterly unopposed. After a trek of about six miles, they came to the farm of Squire Nathaniel Ray Thomas. There they set up a garrison, intending to remain for an indefinite period of time to protect the loyal inhabitants of that town. That day, Marshfield became (to the best of my knowledge) the only Massachusetts town outside of Boston to be occupied by British Regulars for an extended period of time prior to the Revolution. And, perhaps more significant, a large portion of the inhabitants of Marshfield had requested the presence of British troops for their protection. With so many in other towns preparing themselves to muster and, if need be, fire upon such an incursion of Redcoats, how did this strange anomaly come about? In stark contrast to the surrounding towns, Marshfield was a center of loyalism. It is difficult to say whether or not a majority of the town were Tories, but certainly there were an unusually large number of them, and due to their wealth and prominence, they dominated the town. Foremost among them was Nathaniel Ray Thomas (1731-1787), a merchant and gentleman farmer. Five months prior to the arrival of the Redcoats, Thomas had been appointed to the so-called Mandamus Council, the body established by the Massachusetts Government Act passed by Parliament in May 1774. One of what came to be termed the Intolerable Acts, it essentially did away with the Massachusetts Charter of 1691 and provided for stronger royal control in the unsettled colony. Among the measures, the General Court would no longer elect the members of the Governor’s Council. Instead members would be appointed by the new royal Governor. Those accepting an appointment to this Mandamus Council were seen as the most select of the King’s men in the colony, and therefore worthy of the utmost hatred of Whigs and Patriots. Slightly more that a year before the Redcoats arrived in Marshfield, and six months before the Mandamus Council was created, the Whigs in Marshfield staged a protest (uncharacteristic for that town and rather bold on the part of the protestors). On December 16, 1773, the Sons of Liberty in Boston famously dumped a shipment of tea belonging to the British East India Company into Boston Harbor in defiance of the Tea Act. Three days later, the Whigs in Marshfield followed suit. On December 19, 1773, a group of Marshfield Whigs led by two ardent patriots, Jeremiah Low and Benjamin White, broke into the Old Ordinary near the town common and removed a store of tea kept in the cellar there. They also took tea from other houses where it was known to be stored in significant quantities. Much of this tea had already been confiscated by the patriots of the town under the supervision of Deacon Nehemiah Thomas, a Whig who would later represent Marshfield in the Provincial Congress which met at Concord. The tea was being stored for safe keeping, the Whigs forbidding that it should be sold in their town, until such time as it could be returned whence it came. But this was not good enough for men like Low and White and they took action while the more level-headed Deacon Thomas was away. 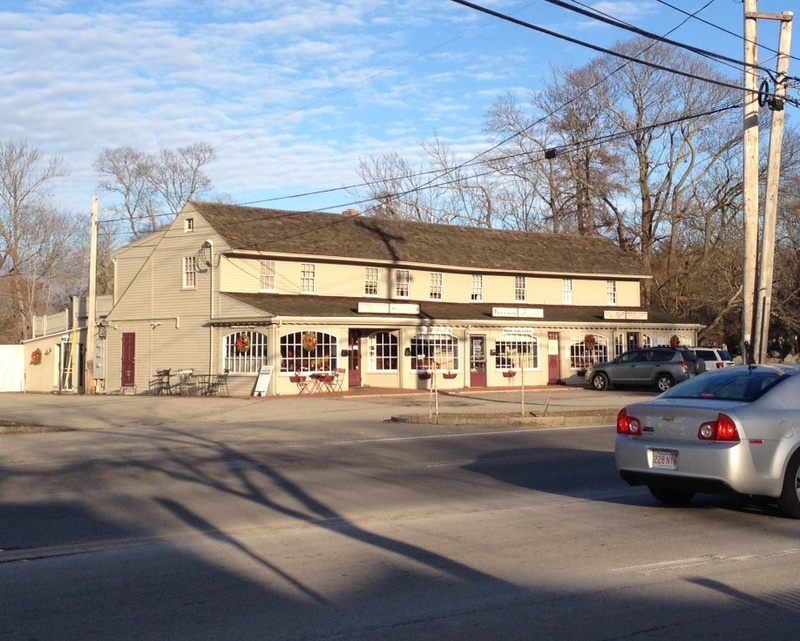 The left side of this building in Marshfield Center was built in the late 17th century. In 1773 it was an Ordinary owned by John Bourne and housed a store of tea which was burned by Marshfield patriots. Loading it all into an ox cart, the patriots proceeded, carrying torches to light their way, to the top of a small hill across from the common. They heaped it upon a boulder there. After saying a brief prayer, the exact words of which are lost to time, Jeremiah Low put a torch to the tea and set it ablaze. The boulder thereafter became known as Tea Rock, and the hill upon which it stood is still known as Tea Rock Hill. Unfortunately, the rock itself has long since been destroyed to make way for development. 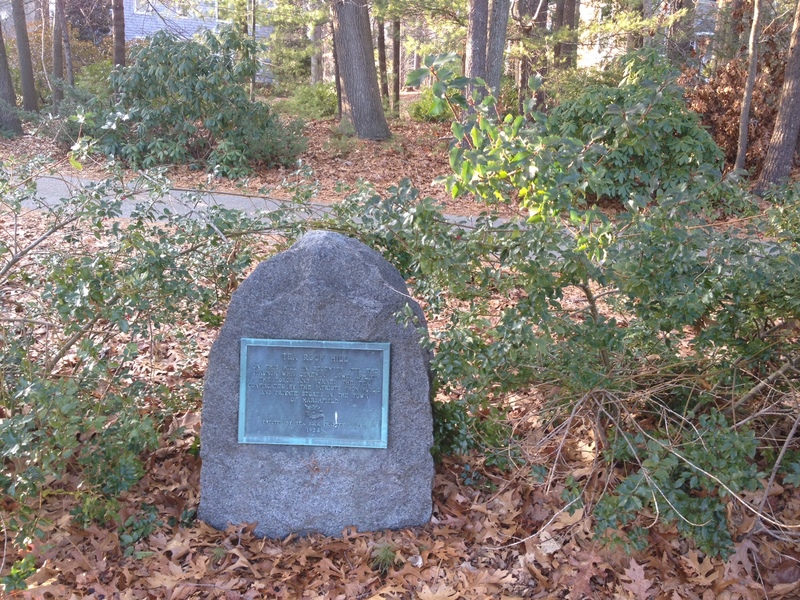 A bronze plaque set into a granite stone, now difficult to find, was placed near the site by the Tea Rock Chapter of the Daughters of the American Revolution in 1928. In a town dominated by Tories, this rebellious action would not be permitted without some attempt at punishment. Shortly after the Marshfield Tea Party, Nathaniel Ray Thomas pushed resolves through town government. These were described in a letter published in the Boston Gazette and Country Journal on February 5, 1774 written by a resident of the neighboring town of Duxbury. Through the resolves, the Town of Marshfield imposed a punitive tax on its own inhabitants. Those willing to denounce the destruction of the tea would be excused from the tax. The measure passed by one vote, an indicator, perhaps, that Marshfield was quite evenly divided between Tories and Whigs. Whether or not anyone actually paid the tax is not clear and the town later rescinded the resolves. The resolves infuriated Whigs in Marshfield and neighboring towns and the “odious” man who pushed them through became notorious…and certainly even more so after he accepted the post of Mandamus Councillor. The mounting anger and frustration aimed at Tories on the South Shore (and elsewhere) would increasingly be vented through acts of intimidation and violence over the course of 1774. Abijah White of Marshfield, who had brought the Marshfield resolves to Boston to be published, thus became the target of much fury and he quickly removed to Boston. In Duxbury the Whigs set up a Liberty Pole and made several excursions across the border into Marshfield to apprehend some of the leading Tories there, carting them to the Liberty Pole, and forcing them to recant. In nearby Middleborough, loyalist Silas Wood was dragged from his home by a large mob to a pond and nearly drowned. He was saved only by the tearful pleas of his children. In Plymouth, a particularly strong center of Whig sentiments, Isaac Clarke (one of the consignees of the tea destroyed in Boston) was assaulted and forced to flee from a mob. Thomas Foster, Esq., a man of 70 who had previously been held in high esteem by Plymoutheans, was chased from his home and hid in the woods while a mob ransacked his house. In Halifax, Plymouth County, Daniel Dunbar, an ensign in the militia entrusted with keeping the old militia banner bearing the insignia of the King, was assaulted when he refused to give up the flag to a mob. They broke into his house, dragged him out, and put him on a rail which he was forced to straddle while they bounced him up and down for three hours. Although exhausted, he still refused to give up the banner and the patriots beat him brutally until he finally surrendered to save his life. Many, many more examples of this sort of coercion and violence could be cited. Perhaps just one more should be included as it was arguably the most notorious such incident in Plymouth County, was directly related to Nathaniel Ray Thomas, and likely influenced his decision to request the presence of the King’s troops in Marshfield. In 1774, Jesse Dunbar (kinsman of the above Daniel), a gentleman of Halifax, Massachusetts, purchased some cattle from Nathaniel Ray Thomas. He drove them to Plymouth to have them slaughtered and the meat sold. While this was being done, Plymouth residents somehow learned that Dunbar had obtained the cattle from the despised Nat Thomas. A crowd soon apprehended Dunbar, placed the carcass of one of the oxen in a cart and then forced Dunbar in the belly of the creature, covering him with all manner of gore in the process. Then they carted him in this condition to the Kingston line where he was forced to surrender some cash for his transportation and handed him over to a Kingston mob. They brought him to the Duxbury line and once again charged him for the ride. The Duxbury crowd, more or less overseen by militia Capt. Wait Wadsworth, at first received Dunbar brutally, beating him with the animal’s tripe, but then allowed Dunbar to get out and walk alongside the cart…until Dunbar made the foolish mistake of tripping one youngsters who was dancing around him as he walked. This enraged the crowd anew and Dunbar was put back into the carcass of the ox. He was carted all the way to the home of Nathaniel Ray Thomas and dumped there. The episode sent a clear signal as to what would happen to those who supported Squire Thomas in business dealings. Nathaniel Ray Thomas House, Marshfield, aka the Daniel Webster Estate. 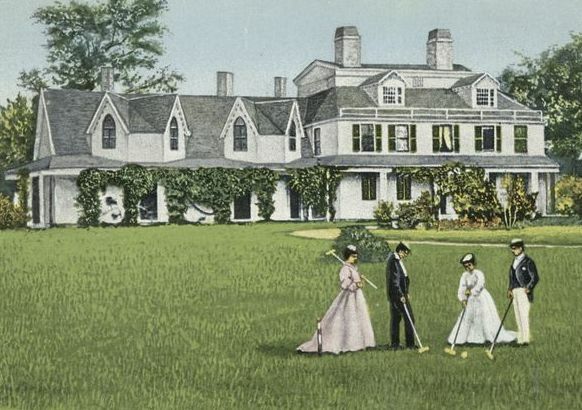 A 1909 postcard depicting the estate as it appeared in 1859. In 1775 there were Redcoats encamped here and certainly no croquet players. On September 6, 1774, a month after he had accepted the Mandamus Council post, things reached a boiling point and the mob came for Nathaniel Ray Thomas. And not just a small rabble. The writer of a letter printed in the Boston Evening Post estimated that roughly 2,000 men from surrounding towns gathered. We can presume some exaggeration but there can be little doubt it was an enormous crowd. Fortunately for Squire Thomas, someone tipped him off and he fled on horseback to Boston, evading a small army that likely would have killed him. He would be back in Marshfield before long. Given what had transpired in the past year, it is little wonder that Nathaniel Ray Thomas and other Tories of Marshfield closed ranks and asked for protection. In January 1775, three hundred Marshfield Tories organized a “Loyal Association” and Thomas wrote General Gage in Boston requesting a detachment of troops. When these actions became known in Plymouth, the Whigs there threatened to force every Tory who had signed the Loyalist agreement off their farms. A repeat of the massive mob might have occurred with more dire consequences…had not the Redcoats arrived on January 23.